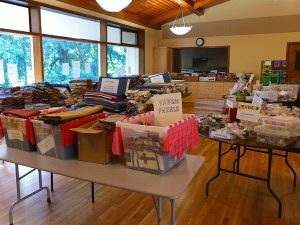 The next Coffee Creek Quilters Annual Fabric Sale and Fundraiser will be Saturday, July 27, 2019. It will be at St. Francis Church Parish Hall, 8818 SW Miley Rd, Wilsonville (right off I-5 at the Charbonneau exit). As we get closer to the date, we’ll post details here and on our Facebook page. All proceeds from the sale will go to support the CCQ prison quilting program.